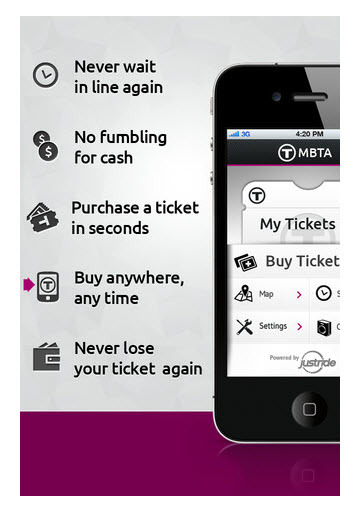 The Massachusetts Bay Transit Authority (MBTA) just announced the passengers on some of its commuter rail trains can now purchase their digital tickets from their Android or iOS smartphones. This new MBTA mTicket app lets users buy a ticket that can display a digital bar code for conductors to scan once on board. Once ticket are purchased, they will be stored digitally in their application’s ticket wallet on the phone. With this new application, customers don’t have to worry about losing their ticket. Just in case if you lost your smartphone, or you replace the smartphone, the tickets can be transferred effortlessly at any MBTA customer service location. The MassDOT Secretary and CEO Richard A.Davey said that, “The new MBTA mTicket app is the latest innovation from MassDOT and the MBTA”. He further said that “Customers will now have the ability to purchase tickets without waiting in lines meaning they get more time back in their day”. The agency said that it is the first public transit agency to move any of its system over to smartphone ticketing, though Amtrak has offered iPhone ticketing for a few months now. At the beginning of the year Waterway ferry system also rolled out the smartphone ticketing. The MBTA claims that over half of its 140 commuter rail stations do not have ticketing booths or machines, so this new system should prove especially useful to commuters at those locations.